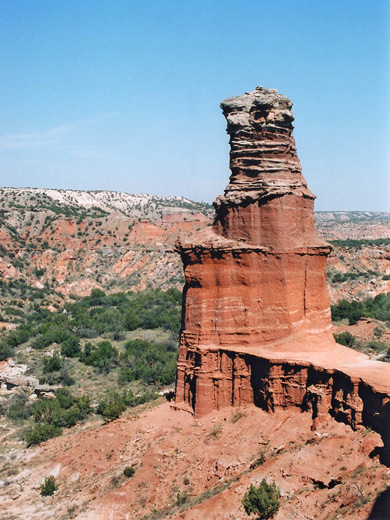 The Lighthouse is the most famous rock formation in Palo Duro Canyon State Park, and is located 3 miles from the road along a relatively easy trail. The busy trailhead for the hike is half way along the park drive, on the west side. 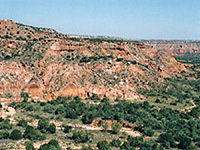 It has an information board and parking area, from which the wide trail heads off westwards, through bushes and over sandy ground, towards the colorful, eroded cliffs that border this side of the valley, about half a mile away. The path bears right, following close to the base of the cliffs, and goes up and down several small hills and stony washes. 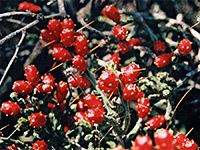 The vegetation thins out somewhat, into a mixture of small bushes and cacti, including two species of spiny opuntia: tree cholla and pencil cholla, which has bright red berries in the fall. The path is also used by both horses and cycles, and remains generally level and well marked, with distance signs at half mile intervals and several rest stops that have benches shaded by trees. The route turns southwest after rounding the side of Capitol Peak (3,158 feet), a summit at the end of Capitol Mesa, and enters a side valley (Sunday Canyon), as the cliffs at either side gradually draw closer. The trail crosses the Sunday Creek streambed several times but this will usually be completely dry. 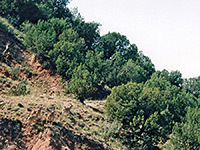 The cliffs now are mostly free of vegetation and exhibit multicolored bands of rock, in shades of yellow, brown, red and purple, quite like the distinctive Chinle Formation of the Colorado Plateau, but actually mudstone from the late triassic Tecovas Formation. Wildlife often spotted in the canyon are mule deer, wild turkey, collared lizards, barbary sheep (an African species introduced to the area in 1957), and, perhaps, western diamondback rattlesnakes. The main path leads to the foot of the 300 foot high Lighthouse formation, a point which marks the end of the horse trail though a narrow, steep ascent continues right up to the base of the pinnacle and beyond. A picture of the formation appears on many street signs of nearby Canyon and is recognised as a National Natural Landmark, though if truth be told it isn't really so spectacular. The views down the canyon are good, and even better from further south, by following fainter paths that lead higher up the canyon sides. An alternative to returning by the same route would be to walk cross country up the north side of Sunday Canyon, across the ridge then down the cliffs at the far side, rejoining the main trail not far from the park road, though a round trip on the official path can take less than 2 hours - a total distance of 5.75 miles and an elevation gain from trailhead to the Lighthouse of 900 feet.